Experience all the flavors of autumn in this smooth and filling vegetable soup. Nutrition Highlights: Butternut squash is brimming with the carotenoid vitamin A, which helps support healthy skin and eyes. *Use vegetable broth for a vegetarian-friendly version of this recipe. Halve the squash lengthwise and scoop out seeds. Place the squash cut side up in a large roasting pan. Cut the carrots and parsnips into small pieces and place around squash, along with onions and garlic. Sprinkle the cut surfaces of the squash with the brown sugar and dot all over with the butter. Pour 2½ cups of broth into the pan and cover tightly with foil. Bake until the vegetables are soft, about 2 hours. Remove the foil and let the vegetables cool slightly. Scoop the squash out of the skins and place in a heavy soup pot. Add the other vegetables and the remaining broth. Season with cinnamon, nutmeg, pepper and salt. Bring to a boil. Reduce to a simmer and let the flavors combine for 10 minutes. Puree the soup in batches until it is very smooth. Return the soup to the pot and add extra broth to reach the right consistency. Heat until soup returns to desired temperature. 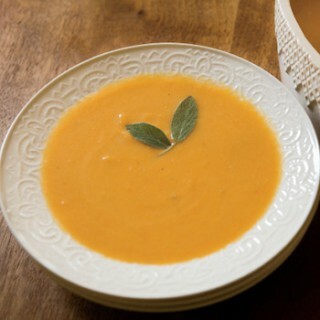 Serve the soup in large shallow bowls, garnished with sage and/or chopped parsley.